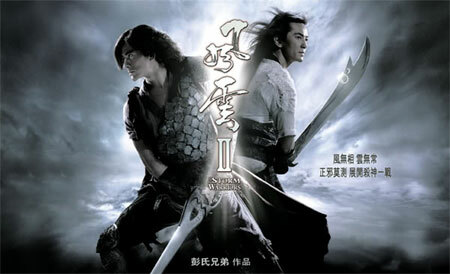 Aaron Kwok and Ekin Cheng ride the storm once more in The Storm Warriors. The Skinny: It's great that they finally made a sequel. Too bad about the actual movie. A technically superior, visually interesting snoozer, Storm Warriors would be the disappointment of the year, if not for that intolerable Murderer movie. Seeing Ekin Cheng and Aaron Kwok back is still a treat, though. Was it worth the wait? Probably not. Will that stop you from seeing it? Also probably not. Based on Ma Wing-Shing's long-running comic Fung Wan, Storm Warriors a.k.a. Storm Riders 2 is so enormously anticipated that it's guaranteed to underwhelm, and the Pang Brothers apparently adjusted for that no-win situation by only catering to their own expectations. Storm Warriors is technically superior and visually dazzling, and returning stars Aaron Kwok and Ekin Cheng bring the casting cred. However, on some level it seems that the Pangs were most interested in the technical aspects of adapting the beloved comic. Storm Warriors is famously 300-like – a digital backlot film that overstylizes things to the point of distraction, with stuff like character, story and emotion falling by the wayside. As a tech demo, this is great stuff. As a motion picture? Well, they got the "picture" part right. Storm Warriors opens with Cloud (Aaron Kwok) and Chu-Chu (Tiffany Tang, replacing Shu Qi) already in the clutches of bad guy du jour Lord Godless (Simon Yam). Also among the captured is Nameless (Kenny Ho), Cloud and Wind's new master and one of the most popular characters in Fung Wan lore. Lord Godless and son Heart (Nicholas Tse) want to (what else?) take over the land and prove their dominance over all martial artists. Cloud and Nameless break free thanks to the arrival of Wind (Ekin Cheng), plus a fortuitous flashback that reveals that they anticipated their situation. However, Nameless is wounded after a spectacular standoff with Godless. With Godless exulting in his momentary triumph, Nameless and his disciples retreat to a remote location to sit around, dispense exposition and brood. In order to stop Godless, the trio decides that they need some serious powering-up. They first seek out Lord Wicked (Kenny Wong Tak-Bun), but his only offer is to turn over his "evil power" to either Cloud or Wind. Since Cloud is too temperamental for the process, Wind is selected to take on the possibly corrupting evil power. Meanwhile, Nameless gives some of his power to Cloud, who begins developing his own sword stance in hopes of taking on Godless. The ticking clock is apparently Godless and Heart's search for a powerful relic called the "Dragon Bone", with the duo threatening the royal family in order to learn the Dragon Bone's whereabouts. Cloud races to stop them, but can he take on the nigh-invincible Godless alone? Will Wind finish downloading the Evil Power so that he can go help Cloud? And can Wind resist the power of the Dark Side, or will he go the way of Anakin Skywalker? Storm Warriors follows Storm Riders by over eleven years, and was actually beaten to the big screen by Dante Lam's animated follow-up Storm Rider - Clash of Evils, which seemingly took place after Storm Warriors in the official Fung Wan timeline. Clash of Evils was entertaining but also dense and somewhat inaccessible to the uninitiated fan. Oddly, Storm Warriors feels even less accessible than Clash of Evils, in that it has little continuity to the previous film besides the presence of Ekin Cheng and Aaron Kwok. At the end of Storm Riders, Cloud and Wind found a tentative partnership, and in the ensuing years, some form of friendship or brotherhood must have developed. But it's hard to see exactly what relationship exists between the two now. They're on the same side now, and the story eventually places them at odds. However, that central conflict only sometimes feels more than routine. Likewise, the new characters and situations are thin. What's the deal with Lord Godless and Heart besides the fact that they're evil? Unlike Sonny Chiba's Lord Conquer, no character details are provided to make the duo more than outlines. Simon Yam is only okay as Godless and Nicholas Tse cuts a charismatic figure as Heart, but the actors aren't given much to work with. Similarly, Charlene Choi is earnestly appealing as Wind's love interest Second Dream, but anything notable about her character is due to the actress rather than the part. The usually good Patrick Tam has a small role as the Emperor, and Lam Suet provides the lion's share of the comedy relief as the portly King Piggy. The most notable addition is Kenny Ho as Nameless. The original actor for Hero from A Man Called Hero (Ho played the character on the television drama), Ho possesses facial features that perfectly match Ma Wing-Shing's comic book art, and he's got presence too. Aaron Kwok and Ekin Cheng are decent live-action representations of Ma's characters, but Kenny Ho looks like he's leapt from a comic book panel onto the big screen. Fidelity to the comic book form was likely a big goal of the Pangs. Aside from Ho's picture-perfect casting, the Pangs put much effort into creating a look that resembles the comic's stylized artwork. It's all very exciting visually, with copious slow motion employed during every single fight sequence. However, instead of being used to punctuate key dramatic moments, the slow motion creates an effective approximation of the comic book panel, with dynamic poses nearly frozen onscreen. One early fight montage resembles a motion comic, while the last half-hour is a super-long fight sequence that stretches on forever thanks to the rampant overcranking. The poses are strong and exciting, but the action is mostly understood rather than experienced. The film's action is very beautiful to gaze at and also obviously arranged, with a static or even lifeless feel that starts to feel numbingly two-dimensional. It's pretty, but not much else. The locations are small and confined, and there's never a sense of the larger fantasy world that Storm Riders convinced us of. The first film was chided for having too many characters, but Storm Warriors could have used that packed cast simply to bring some color and expanse to its world. Civilians or bystanders are never glimpsed, and the characters never travel anywhere beyond three or four interior sets. Tiffany Tang is a passable replacement for Shu Qi, but she doesn't have Shu's bubbly character or liveliness. Also, nobody delivers dialogue when they're walking or moving. People stand around discussing exposition, and revelations are handed out verbally. When Cloud develops a new sword style, it's not shown, but simply explained by Nameless while he and Cloud stare into the distance at nothing in particular. This would be dramatic on the page, but on the screen it's only a shade above boring.